My thoughts on the 8th single from Budokan headliners Juice=Juice. 2. KEEP ON Joshou Shikou!! I’m pretty sure that by the time you’re all reading this (writing a bunch of stuff in advance of my Tokyo trip here) Juice=Juice will have completed their goal and performed at the world famous Nippon Budokan. This will mark the culmination of an absolutely relentless national (with a few international dates sprinkled in) tour that has lasted almost a year and a half and seen the group play 220 shows in that time. That’s a pretty impressive accomplishment for most acts, especially if they’re not an internationally renowned, multi-platinum touring outfit. Congratulations to all involved in this undertaking. Now, partly because of this tour we haven’t really been getting too much in the way of new music from Juice=Juice recently. Fair enough I guess, I’m not sure where they would even find time to sleep given that touring schedule. Their last release was the single “Next is you! / Karada Dake ga Otona ni Nattan ja nai”, which was actually one of the first articles that I wrote for this site back in February of this year (man, almost 12 months already?). You can of course go back and check that out if you so wish, and probably have a chuckle at how bad the writing is. Improvements have been made folks. Anyway, I really enjoyed that last single (the “Budokan” drama it was promoting was also pretty good) and I typically enjoy most of the music that Juice=Juice release. They just don’t really release enough of it in my selfish opinion. 3 singles and an album in the past 2 years, come on man slide that needle in deeper why don’t you!?! Naturally I’m coming into this single expecting something pretty good but given the musical slump that Hello! Project seems to have been in this past year I’m trying to temper my expectations a little bit. Although Juice=Juice firing on 70% is probably still better than most groups on 90 or 100%. The first song on this triple a-side release (please Hello! Project, no mas!) is “Dream Road ~Kokoro ga Odoridashiteru~”, which I’m assuming is making some reference to their road to the Budokan. I don’t really speak Japanese folks, so if that’s incorrect then my bad. Anyway, this is another song using EDM for the instrumental duties. The opening sequence there kind of reminds me of that one Skrillex song, “With You, Friends (Long Drive)” I think it’s called. This song doesn’t follow a similar progression though, for better or worse (I think it would have pretty cool honestly). So yeah, this is a kind of ballad type thing I guess. The vocals in the verses at least sound pretty dramatic and serious, although they do change it up and get a bit more energetic for the chorus. 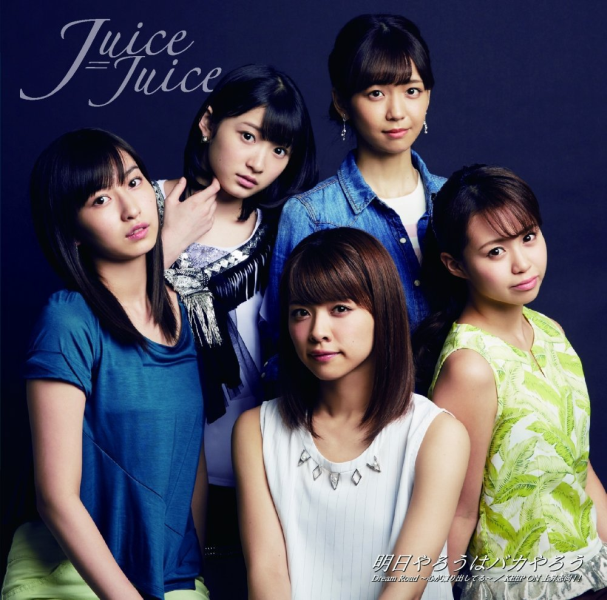 Juice=Juice do these kinds of songs really well, even if it’s not something I’d be rushing out to listen to. One thing about this song that I didn’t particularly care for were the synthesized…horns I guess is what they were trying to be. I dunno man, it sounded kinda funky and not in a good way. Other than that, this is another solid entry into the Juice=Juice discography that needs to expand faster dammit! “KEEP ON Joshou Shikou! !” is next in the running order and once again Juice=Juice are playing to their strengths with a funky (in a good way this time) little number. This song definitely makes you want to get your groove on (man do I sound old saying that), although I’m not sure I’d want to try some of the moves they’re doing in the MV. I’d probably dislocate a hip or something. I was a bit unsure of the song when it was first starting up, mostly because it was really beginning to sound like a really cheap knock-off of something Morning Musume would probably have done 10 years ago. Thankfully I was pleasantly surprised as the song swerved off into a much more enjoyable direction. I do sorta wish there was more of a hook to the vocals but I guess the instrumental is what’s supposed to carry the weight on that front this time around. Of course I’m by no means knocking the vocals, because as usual Juice=Juice are at their best regardless of what they’re given to sing. I think if the previous song wasn’t really your thing, then if you’re anything like me this one will be much more up your alley. I’m definitely digging the variety on show so far regardless. Last but by no means least is “Ashita Yarou wa Bakayarou” and this is a bit of a departure musically from what we typically know Juice=Juice for. This song has some pretty heavy Rock leanings, which as I say isn’t something you see out of Juice=Juice very often. Of course their vocal delivery is still very much staying in their comfort zone but man does this sound different and refreshing. Sure there’s still some EDM elements making an appearance every so often but the whole thing actually works together pretty well and doesn’t sound like they’ve tried to Frankenstein two totally different songs together. Most importantly for me, this song is pretty damn catchy. A lot of it comes down to the vocal delivery in the more Rock heavy parts but this is definitely a song that I can see getting a lot of play on my portable music player of choice (i.e. my phone). I actually think there’s quite a lot of room to explore if Juice=Juice were to venture a little further down this path in future releases. If nothing else it’s pretty different to what the rest of Hello! Project is doing right now. Maybe a change of direction musically would help the company get out of this perceived slump that they’re in right now. They might make us wait forever between releases, but boy do Juice=Juice deliver when they do. Let’s not get carried away of course, there’s a couple other Juice=Juice releases that I’d personally rank higher than this one. That being said, this is Juice=Juice living up to their usual high standards and they even brought along something a little bit different to the party this time. If you’re a fan then I think you should be pretty happy with this release and if you’re not, then what are you even doing with your life? I’m interested to see where Juice=Juice go from here though. I mean, they’ve achieved their goal of Budokan so what’s next? Saitama Super Arena? Tokyo Dome? Disbandment? Maybe we’ve already found out via an announcement at their Budokan show and I’m looking like a right idiot right now because I wrote this review in advance.